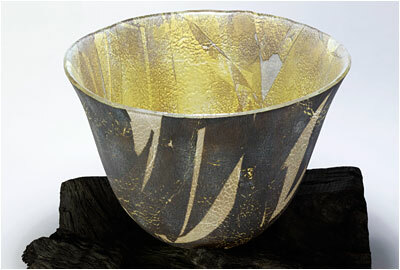 Golden Vessel #1111 Materials: Reactive Bullseye Glass Dimensions: Dia. 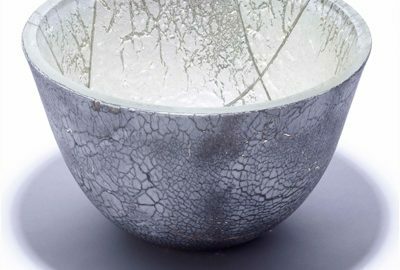 350mm x 220mm Deep Technique: Kiln-formed, diamond-engraved and fire-polished. Price: £5500 GBP ACQUIRED: for The Elizabeth Mead Collection (Private Collection) Washington DC USA. Silver Vessel #0111 Materials: Reactive Bullseye Glass and Fine Silver Dimensions: Dia. 240mm x 145mm Deep Technique: Kilnformed, diamond-engraved and fire-polished. Price: £3100 GBP ACQUIRED - by Private Collector at "Collect 2011" Saatchi Gallery London UK.